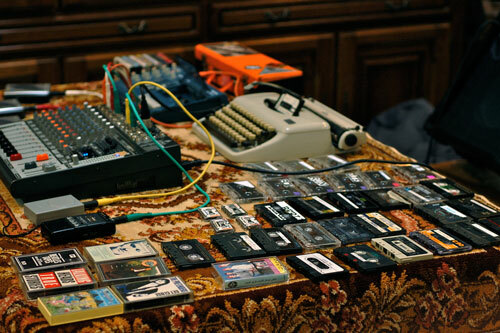 As Preslav Literary School, Adam Thomas makes live tape collages using sounds drawn from an ever-growing archive of self-generated or discovered outsider noise, found sound and spoken word cassettes. A process of transference, overdubbing and live manipulation reworks these source materials into compelling, ambient broadcasts. Preslav Literary School has released records on NO-FI, Razzle Dazzle and Elephant & Castles, sharing stages and bills with Aki Onda, Machinefabriek, Gudrun Gut & AGF, Anton Bruhin, Leif Elggren and Sudden Infant. Preslav Literary School has toured the UK, Switzerland, Holland, Belgium and Poland and played at Flux/s 2010, Shift Festival 2010, STRP 2010 & transmediale.11.